We have been in our house for over a year and finally have a mudroom! This has been on my "honey-do" list for awhile, so I'm thrilled it is finally complete. Our house has had two laundry rooms (one is right off the kitchen that leads into the garage, the other is in our finished basement). I don't mind taking laundry downstairs and Conor wanted our new dryer to be gas (which the basement one is equipped for), so we converted the main floor laundry into a mudroom. I don't have any "before" pictures, but it was really just an empty space and just begging for us to bring it to life. Typically I have big ideas for projects, along with plenty of "pinspiration", but Conor really handled this one solo. He drew up his own plans in true engineer-with-graph-paper fashion & did all the labor. I merely approved a few decisions and he was off! Actually, that was not all... I had to wrangle the toddler while said project was being worked on. That is no easy feat, but Liam LOVED to "working" with his daddy so Conor did his fair share of keeping him entertained. One of the little girls in our neighborhood (age 7) is always so impressed with what Conor is working on. She also may have a teensy tiny crush on him... The other day she was admiring our big backyard deck & Liam's swing set that were both built by the hands of Conor, when she informed me that, "When he grows up, he could be a professional!" Kids...love 'em! First, I feel pretty good about that fact that at age 28 we are not yet grownups. Secondly, I'm not exactly sure what kind of "professional" she was referring to, but at least Conor has a fall-back if his engineering/corporate career doesn't quite work out for him! Stop with the chitter chatter Laura; onto the room! The fact that I am not a professional photographer paired with this tight space and the room seeing very little close natural light, makes for some blah pictures. Nonetheless, I love how it turned out! The wainscoting, the bench, the cubbies (notice the tall boot slots! ), the crown molding, the new key shelf/ledge that matches the trim...love it all! Paint wise, we went with Benjamin Moore Evening Dove, Coventry Gray, & White Dove. We had used Evening Dove in the guest bath, master bath, and custom (Conor) storage benches of our Seattle house and absolutely loved the color, so we wanted to use it again. Plus, agreeing on paint colors is quite the ordeal (read: high emotions, possible raised voices), so we avoided that whole process here. We love the high quality of Benjamin Moore paints, so consider us brand loyal! We use the Natura line since it is no-VOC and environmentally friendly, for paint. You can barely even smell this paint, even when it is still wet, skip the primer just apply two good coats; I can't say enough good things! The shoe cubbies are deep enough to stash 2 pairs of shoes in each toe-to-heal so it can hold 20 pairs of shoes and 4 pairs of boots! This room is already getting plenty of use and helping to keep the main floor a lot less cluttered! However, the room still needs some work in the decorating department. I'd love to hear any suggestions... I have not idea what to put in the top cubbies at this point, but I'm thinking some big vases on top, behind the crown molding and possibly some small prints or artwork for the walls. That is, until Liam is adding his own artwork to the house! I can already picture little L coming home from preschool and hanging up his tiny backpack & coat, sitting on the bench as he takes off his shoes, and telling me about his day. Life is only getting sweeter! 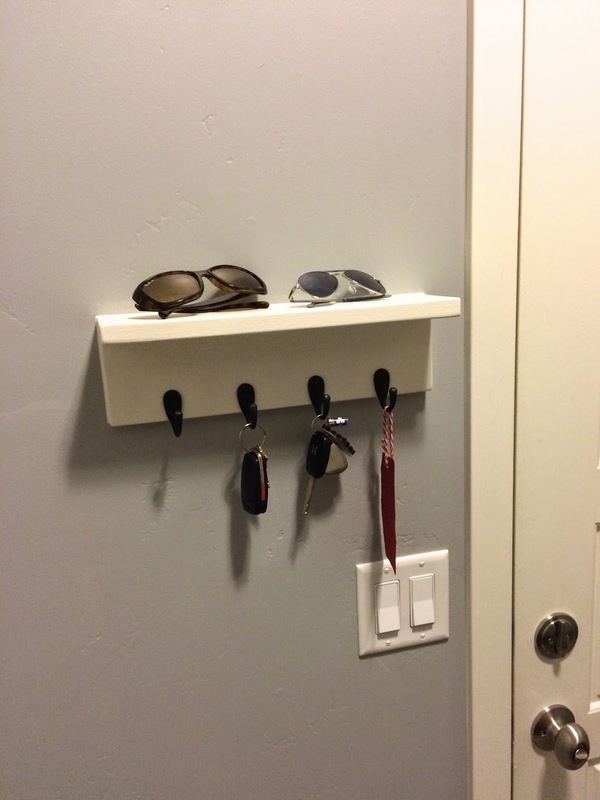 Was the key shelf DIY too? The whole thing is beautiful! I love the idea of adding Liam's artwork to the walls. In the meantime some bright colored prints would be perfect! It looks great! 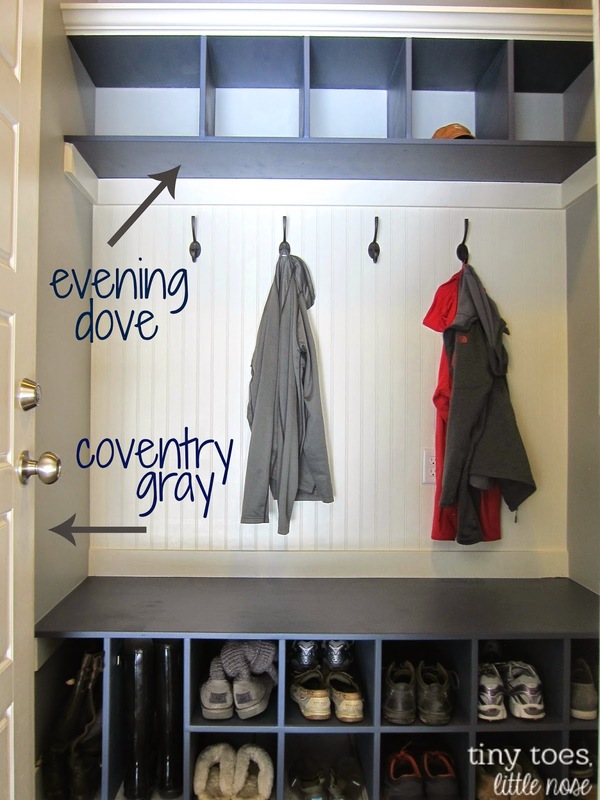 I wish our house had the space for a mudroom! The houses in FL aren't made with mudrooms, boo! Amazing! I love it! I have always wanted a mudroom. What a great job! Great job!!! your lucky to have such a talented husband! !